Dallas here from the Shopify Social Care Team.Thank you for sending over some examples of the links that you are wondering about. I do see what you mean. Unfortunately, that isn't something that is able to be adjusted. 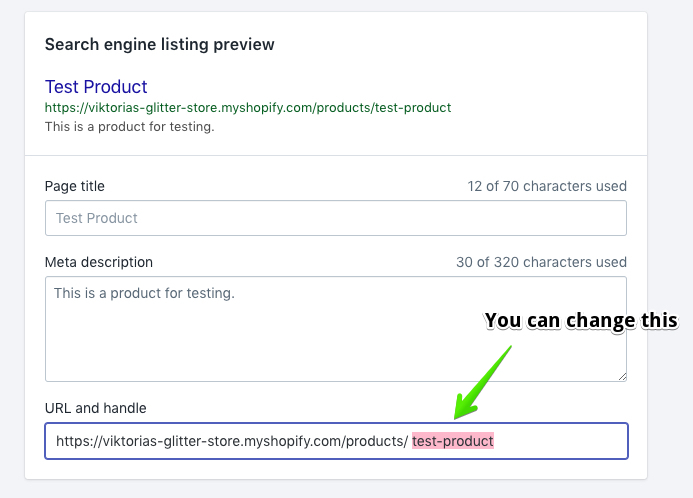 All Shopify-generated URLs are not customizable, only the handles are. That means that you could change the product name in the URL, however, everything else will stay the same. To adjust that you would just scroll down to the SEO section of your product page in your store admin. You are able to adjust what the handle in th URL bar says there. The reason that you are seeing "?view=quick" is because you went through the Quickview to get there. Basically, a URL is like breadcrumb navigation. Whatever the path was that led you to the page that you are on will be documented in the URL bar at the top of the page. I completely understand how frustrating this must be for you so I have gone ahead and sent a message about this to our Merchant Frustrations team. I can't promise that they will reach out to you when, or if, an adjustment is made. All the same, I've added your concerns for them to look into. I hope that helped to clarify and I wish I could be of more assistance. If you would like any more help with anything else please let me know and I will be happy to assist you. If you would like to talk with one of our live care gurus they are here 24/7 to answer any questions that you may have! Thank you for your time and for your answer. My problem is not about the URL content but about the URL itself. I would like to understand why this URL is created ? And if it is useful ? Ptherwise I am thinking of creating redirection to the product page. When it comes to domains for your site the reason that the "?view=quick" is there is to showcase the path that your customers take. All domains are basically a form of breadcrumb navigation that your customers can use to track how they got to where they are. ?view=quick is shown in the URL because that was the route to how they got to the product. Is there anything we can do to fix this? Hey @Solene, this is a common issue we have seen with some sites on Shopify, so common that we actually have a check for this on our app. It is usually solved by adding a nofollow on links that go to the quick view (usually on the collections page), it is usually not a problem for customers, but Google sees them as links and adds them to their index, for example by searching for your site on Google like this: Quick View Google Search you will see Google has already indexed hundreds of pages on your site for those URLs. Another option is on Google Search console to tell Google to ignore the ?view=quick query parameter. If you need any help we could help you out on solving it. It might be caused by a Shopify App or Theme, so you could also reach to them and ask them for support on that.